Want to perform, but tentative about auditions? Auditioning is part of the process for all actors, but it can be intimidating. However, it can also be a lot of fun. 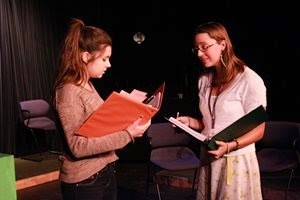 Every audition offers a chance to perform, learn, gain experience and connect with other actors. And if you’re prepared, it’s a lot easier! The Patel Conservatory is offering two free audition workshops to help students in grades two through adult learn how to prepare for an audition and what to expect. In these workshops, students will work with Patel Conservatory theater faculty to gain knowledge and understanding of how to be successful and confident in auditions. The workshops will include lecture and coaching on the process, requirements and expectations for a musical theater audition. Topics include selecting material, memorization, creating resumes, slating, headshots and much more. On Nov. 15, instructors Matthew Belopavlovich and Audrey Siegler will work with students in grades two through four. On Dec. 6, instructors Sean Paris and Matthew Belopavlovich will work with students in grades five through adult. Both workshops will include an informational session for parents to help them understand the process and how to help their students succeed in auditions. These workshops are a great way to prepare for the Conservatory's upcoming auditions for our spring theater productions of Winnie the Pooh, Kids and Fiddler on the Roof. For more info on audition dates, click here. RSVP is required. For more information, or to RSVP, please contact Audrey Siegler at 813.222.1073 or audrey.siegler@strazcenter.org.